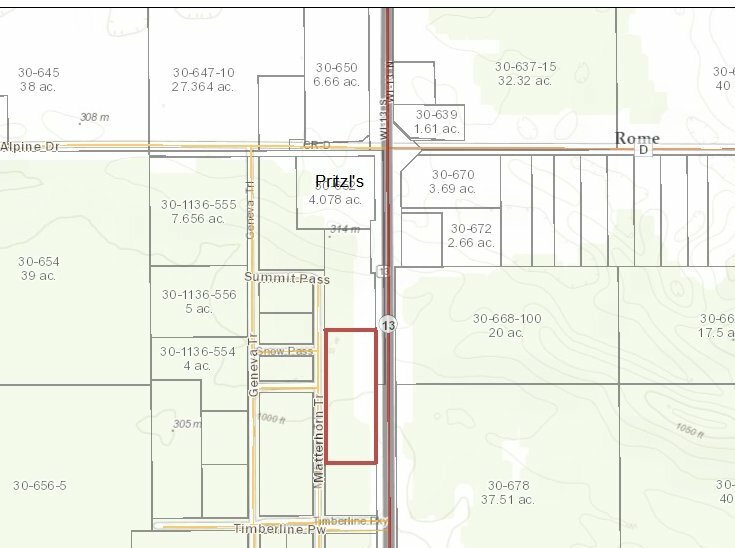 Improvements: Located in Rome's Alpine Village Business Park, this 5-acre parcel abuts Highway 13 with 747' of frontage, and is wooded with whispering Norway pines. Property is zoned for retail and subject to the Alpine Village Design Manual. Great highway visibility, and very close to Pritzl's Trading Post ... no one goes to Rome without going there! Excellent exposure in a growing community. Rome is home to Sand Valley Golf Resort, 4 shimmering lakes, Lake Arrowhead Golf, and 50 square miles of FUN. A great place to Live, Work and Play!